Terrorists struck multiple locations across Paris leaving over 100 people dead in "highly coordinated" attacks including multiple shootings and a bombing at a soccer stadium. President Obama pledged U.S. support to track down the perpetrators and called the terrorist acts an "attack on all of humanity." The New York Times' David Sanger reports on the reverberations beyond the French capital. On the 2016 campaign trail, Donald Trump took aim at his Republican rivals this week, comparing his co-frontrunner Ben Carson to a child molester. Jeanne Cummings of The Wall Street Journal reports on Trump's campaign rhetoric. Reid Wilson of Morning Consult and Angie Drobnic Holan of PolitiFact report on the fourth Republican debate and the discussion about what it means to be a conservative. 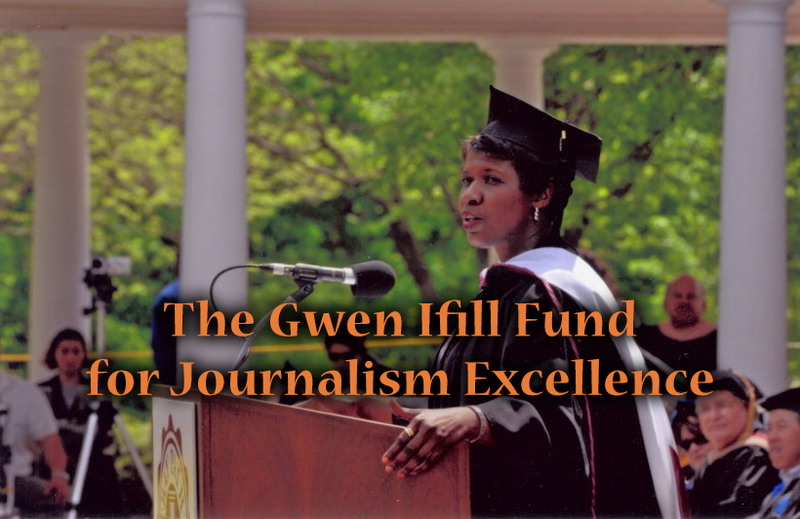 GWEN IFILL: Attacks in Paris, politics at home. We cover the week tonight on Washington Week. Dozens dead, more wounded in Paris. PRESIDENT BARACK OBAMA: (From video.) This is an attack not just on Paris, it's an attack not just on the people of France, but this is an attack on all of humanity and the universal values that we share. MS. IFILL: French borders closed tonight and, again, more questions than answers. Back in the States, politics as usual. DONALD TRUMP: (From video.) How stupid are the people of Iowa? MS. IFILL: Trump insults, Carson shrugs. DR. BENJAMIN CARSON: (From video.) I expect that kind of thing, but I don't have to give into it. MS. IFILL: As Republicans spar over immigration, taxes, foreign policy, and each other. SENATOR MARCO RUBIO (F-FL): (From video.) Ted is a supporter of legalizing people that are in this country illegally. MS. IFILL: Meanwhile, Hillary Clinton widens her lead in the condensed Democratic field. FORMER SECRETARY OF STATE HILLARY CLINTON: (From video.) The politics of immigration reform may seem complex, but the economics are pretty straightforward. MS. IFILL: As the three left standing prepare for a weekend debate. Covering the week, David Sanger, national security correspondent for The New York Times; Jeanne Cummings, political editor of The Wall Street Journal; Angie Drobnic Holan, editor of PolitiFact; and Reid Wilson, chief political correspondent for Morning Consult. MS. IFILL: Good evening. As we go on the air tonight it is early Saturday morning in Paris, where a wave of horrific attacks have placed the country on lockdown. Earlier tonight President Obama called the terrorism heartbreaking. PRESIDENT OBAMA: (From video.) Obviously those of us here in the United States know what it’s like. We've gone through these kinds of episodes ourselves. And whenever these kinds of attacks happened, we've always been able to count on the French people to stand with us. They have been an extraordinary counterterrorism partner. And we intend to be – bear with them in that same fashion. MS. IFILL: It feels like these Friday the 13th attacks came out of the blue, yet it makes us think back to the Charlie Hebdo attacks. How is this similar? We know it's in Paris. How is it different, David? DAVID SANGER: You know, other than the fact that it’s in Paris, it seems more different than the same. Gwen, if it reminds me if anything, it reminds me of those attacks in Mumbai, India in 2008, because of the highly coordinated nature of this. Now, we don't know all of the details at this hour, but it looks like there were at least six or seven simultaneous attacks. And that suggests that it was highly coordinated and probably that the attackers had to engage in some fairly intense training. I think the big question is going to be going forward, did that training happen outside of France? Could it have happened in Syria? Could it have happened in Iraq? And if so, it could raise the level of the conflict in the Middle East to a very different plateau. MS. IFILL: In terms of bloodshed, what also comes to mind is the attacks – the rail attacks in Spain in 2004, and also the Beslan attacks – the school attacks in Russia. And they were also hundreds, more than we've heard so far, of casualties. Do we – thinking back to those attacks, are there similarities there? MR. SANGER: There certainly are. And, of course, each one of these attacks becomes an inspiration to other terror groups. And I think there are elements of the Russia attacks, which were Chechnyan in origin. There are elements of – certainly of what you saw in Spain, and what you saw in London in 2005. But the scale of this, where at this hour The New York Times is reporting, quoting the police as – in France as saying over 100 dead, perhaps in that theater alone. That would take you more toward the scale of the Russia attack or Mumbai. And, you know, that's so much bigger than what we saw happen in Charlie Hebdo. But I think the other question that this raises right now is, you know, if this is in fact the great conflict of our time, of religious extremism, is it even possible to fight it when so much of it is right in among the populations? I mean, in both Britain and France we know of hundreds of people who joined the fight, thousands in some cases, with ISIS, with other extremist groups. And then, of course, who have the passports to come back into Europe. MS. IFILL: And forth, yeah. JEANNE CUMMINGS: David, I’m – we talk about the coordination that's going on in the France attacks, but if you look at the week or the last two weeks, you have the Russian plane, you have the Beirut bombs that also went off simultaneously, and this. Do you think, you know, what – is that pattern relevant? MR. SANGER: It could be if in fact it turns out that this was coordinated ISIS or coordinated al-Qaida. You know, if you asked three or four months ago to counterterrorism experts, they would tell you that ISIS so has its hands full in trying to deal with holding on to territory in Syria, especially now with a counterattack that began just 24 hours ago to cut the road near Mount Sinjar and elsewhere, that – and, of course, that's dealing with the Iraq part of ISIS – that people didn't think they had the bandwidth. MS. IFILL: – that it was under control? MS. IFILL: That this is ISIS. MR. SANGER: -- that this is ISIS. And, you know, sometimes with the groups that seem to have some allegiance, it's not clear what the connection is and it's also not clear what the coordination is. You know, we all think back to 9/11, where there was clear coordination out of al-Qaida central in Pakistan and Afghanistan at the time. But in this case, we're not sure. This could just be sympathizers. But if so, they were very well-coordinated and organized sympathizers. REID WILSON: David, Charlie Hebdo wasn't even the first attack in France in recent years. There had been attacks on Jewish targets in the south of France, on the train in France where three Americans tackled a gunman. Why is it that France is at the epicenter of all these attacks in Europe? MR. SANGER: France, like Germany – 9/11 was planned – a lot of it was planned in Hamburg. So, you know, you could have said, why Germany? But each of these major centers have significant immigrant populations, significant Muslim populations, where there is a small segment of it that gets radicalized. And that's been the very hard part to ferret out. And, of course the fact that Europe now has open and free borders means it's that much easier to move across. MS. IFILL: And when the president says, as he did tonight, we will stand by to help in any way possible, what does that mean at this stage? Do we know? MR. SANGER: Well, you know, the evidence for this I think, Gwen, may have come just hours before this, when you saw a drone strike on a target that they thought was Jihadi John, the executioner for ISIS. He is – he was supposed to be – he was a British citizen. We don't know for certain that he's dead, but they – most defense officials seem today to think that they had actually gotten him. And that was a case of the U.S. and Britain working very closely on the counterterrorism side to identify where he was. MS. IFILL: OK. So we'll see if we can do the same thing. Again, thank you very much, David. There is quite a bit else to sort through tonight. We’re going to start with last night's remarkable Donald Trump speech, during which he called one opponent weak, he questioned another's religious conversion, and he said of ISIS, I would bomb those suckers. He said more that I can't actually repeat on television, but here’s a bit of his Ben Carson critique. MR. TRUMP: (From video.) So he's a pathological, damaged, temper a problem. Then they talk about my tone is a little bit tough. Give me a break. MS. IFILL: He also compared him to child molesters. Carson, in his normal, calm tone replied today. MR. CARSON: (From video.) That's not the kind of dialogue that I would ever engage in. And I'm hopeful that maybe his advisers will help him to understand the word pathological, and recognize that that does not denote incurable. It's not the same. It simply is an adjective that describes something that is highly abnormal, and something that, fortunately, I've been able to be delivered from for a half a century now. MS. IFILL: I've never seen anyone respond so calmly to being called that many names in one speech, but that's who Ben Carson is. What is going on? MS. IFILL: That's the word he used. MS. CUMMINGS: Oh, that’s the word he used. But, of course, he says we all misinterpreted it. It was just a question. So he's not backing down. And that is directly a result of those poll numbers. And it's interesting, because the Republican primary is becoming kind of two races. We’ve talked about this, we got the outsiders and the insiders. And on the insiders, it's becoming more of a Cruz-Rubio fight. And the two of them have had this parallel exchange over immigration where they're sniping at one another. MS. IFILL: I want to get to that, but first before we get to that, I want to stick with Trump for a little longer. MS. IFILL: Because during the debate – and, Angie, I'm going to ask you about this – he had something to say about – everybody’s had something to say this week about immigration. But this was Trump's latest – aside from building a wall – his latest idea. MR. TRUMP: (From video.) Let me just tell you that Dwight Eisenhower, good president, great president, people liked him. I like Ike, right, the expression. I like Ike. Moved a million and a half illegal immigrants out of this country. Moved them just beyond the border. They came back. Moved them way south. They never came back. OHIO GOVERNOR JOHN KASICH (R): (From video.) But if people think that we are going to ship 11 million people who are law-abiding, who are in this country, and somehow pick them up at their house and ship them out of Mexico – to Mexico – think about the families. Think about the children. MS. IFILL: OK, Angie. You work for PolitiFact. Check that fact. ANGIE DROBNIC HOLAN: That’s right. We did fact-check his recounting of the Eisenhower years. We rated it half true. It wasn't nearly as many as he claimed, over a million. The actual numbers were around 250,000. And it was a controversial program. It wasn't just I like Ike and everything was fine. It got a lot of attention at the time. It also went along with a guest worker program, so that they were opening up more opportunities for immigration. So his history lesson is somewhat flawed. MS. IFILL: Reid, this – it's interesting to see Republicans fighting about immigration, because – at least now, at this particular juncture. Why now at this particular juncture? MR. WILSON: Because we're getting into the real part of the campaign. We're getting past the part where they introduce themselves at barbecues in Iowa and to the part where they have to differentiate themselves, because Iowa voters and New Hampshire voters are actually starting to tune in. And one of the very few real places within the Republican Party where there is a schism is on immigration. Jeanne mentioned the sort of dual track campaign that we're seeing. On one hand, you’ve got folks like Donald Trump and Ted Cruz who are playing to the activist base that feels very strongly against a path to citizenship. On the other hand, you’ve got people like – we played the clip of John Kasich, the governor of Ohio, and Jeb Bush, the former governor of Florida, both of whom are more open to a path to allowing workers into the U.S. I mean, this is – this is the activist Republican Party against the Chamber of Commerce Republican Party. MS. IFILL: Why are the two Latinos in the race, Ted Cruz and Marco Rubio, at loggerheads right now? It seems that at one point they kind of agreed with each other. MS. IFILL: Depends who you talk to? MS. CUMMINGS: Well, yeah, I mean, it depends on what the definition of is is, right? (Laughter.) They split words – hairs on these things. But the simple facts are that Rubio voted for the immigration overhaul in the Senate and Cruz voted against it. But you raised them, and they are an interesting story. They’re both 44. They're both first-time senators who aren’t bothering to finish their terms. They're both Cuban-Americans. But they tell their immigrant story for very different reasons. Rubio, who’s fluent in Spanish, he tells his story to connect with Hispanic voters. Cruz tells his story in English, because he's not a very good Spanish speaker, and he talks about how his father was an alcoholic, left them after they got into the U.S., found God, and came back and was a good father. It's an Evangelical story. They talk right to their bases. MS. IFILL: Except that Cruz used to say that he was against birthright citizenship, and now he’s decided that it’s OK.
MS. IFILL: That it’s not OK.
MR. WILSON: Well, the last 48 hours or so, is that these two candidates particularly, both of whom are rising in the polls, are finally establishing themselves as potential top tier candidates, have gone after each other on these very specific elements of actual immigration reform. Cruz has been attacked on his H-1B visa program proposals. Rubio has been attacked for his Gang of Eight membership. They have both been very ready for those attacks, which just tells me how much they all knew that immigration was going to be a determining issue in this primary. MS. IFILL: And one other thing – one other – Well, and at the root of all this, all these candidates at this stage, at least, are all arguing about who is more conservative. We saw this on the debate stage this week involving Rand Paul and Marco Rubio. SENATOR RAND PAUL (R-KY): (From video.) But Marco, Marco, how is it conservative – how is it conservative to add a trillion-dollar expenditure for the federal government that you're not paying for? MS. IFILL: Angie, what's true? MS. HOLAN: You know, we gave Rand Paul mostly true on his attack. He is essentially correct that that Rubio is proposing a large tax credit program. It would come out to about a trillion dollars over 10 years. He also advocates more funding for the military, roughly a trillion dollars over 10 years. Now, Rand Paul calls the tax credits a welfare program, which is inflammatory and you can argue with it. But on the numbers, he's pretty spot on. And it was a real moment, I thought, in the debate where they were talking about what is the real issue here? Because how can they pay for tax credits and more military spending? It doesn’t make – it doesn't add up. MS. IFILL: It doesn't add up. MS. IFILL: It’s an old argument, isn’t it? Yeah. MR. SANGER: Yeah, about where just the overall number. And I thought Republicans had by and large moved past that, even during the Bush administration when Bob Gates was out making the case. MS. IFILL: Well, it’s clearly a different kind of campaign. And in the middle of it all is Jeb Bush, who’s trying to say that if you want someone to be the next president, someone who can beat Hillary Clinton, what you really want is someone with a little experience. This is Jeb Bush. FORMER FLORIDA GOVERNOR JEB BUSH (R): (From video.) We need to start thinking about who’s the person that can beat Hillary Clinton, rather than trying to get into small differences between each campaign. The big difference is Hillary Clinton will double down on a failed economic policy, and I have leadership skills to fix these complex things to allow people to rise up again. MS. IFILL: And when Carly Fiorina tried to cut in line, Donald Trump said, why does she keep interrupting? MS. CUMMINGS: So he – you know, he – they feel as though they’ve sort of stabilized the situation. However, when you look at the reactions in crowds – there’s a big summit going down in Florida right now, so home state. And the crowds react to Cruz more so than even Rubio, and definitely more so than Bush. MS. IFILL: I want to – I don’t want to leave the Democrats out of this conversation, because it’s really interesting to me how the mainstream – as you just saw, Jeb Bush – mainstream Democrats, insider Democrats are responding to Hillary Clinton, the putative – clear front-runner, as opposed to how mainstream Republicans are responding to their outsider front-runners. MR. WILSON: And I think what that tells you is that the Republican Party remains in much more upheaval than the Democratic Party does. I think there are many different competing factions on the Republican side, whether it’s the Chamber of Commerce or the activist class on immigration or the Religious Right or any of these factions that are vying for some kind of control. MR. WILSON: Well, of course. But it’s very clear that Hillary Clinton is moving towards the Warren wing of the party and adopting some key elements of that platform. I note, by the way, that tomorrow night at their debate in Iowa, it’s going to be on TV opposite the University of Iowa’s game against the University of Minnesota. The University of Iowa is undefeated this year. How many Iowans are really going to tune in on a Saturday night to watch a game opposite their favorite football team? MS. IFILL: I hadn’t even thought of the football part. MS. IFILL: Well, there’s a – one wants $12 for minimum wage and one wants ($)15. That’s a $3 difference. It could be huge. MS. HOLAN: Yeah. Fact-checking these two different debates is very different. MS. IFILL: Tell me, how is it different? MS. HOLAN: I’m being charitable. MS. IFILL: I think we can establish that’s it’s off the cuff. MS. HOLAN: He’s not – he doesn’t seem to be using any kind of briefing book. So, you know, we’re seeing a lot to fact-check on the Republican side because it’s more raucous. It’s more freewheeling. MS. IFILL: This could change on Saturday. MS. CUMMINGS: – because Bernie’s under so much pressure to stop Hillary’s inevitability. MS. IFILL: But there was a lot of policy on the table in this week’s Republican debate, and one of them is the big, bad China. Ben Carson says that China has boots on the ground in Syria and Donald Trump was talking about China having to do with trade. Did any of that hold up? Is China involved in – I mean, China’s involved in a lot of stuff. MS. CUMMINGS: Did he say boots on the ground? Check us. MS. IFILL: He said there is influence. MS. HOLAN: The context certainly made you think he was talking about a military presence. MR. SANGER: Well, I mean, you could well have had contractors in the region. Certainly you do elsewhere in the Middle East. But in – when you got to the trade discussion, that was really fascinating because Donald Trump went off and discussed the Trans-Pacific Partnership as basically a large Chinese plot to work their way around us – until it was pointed out to him that the Chinese are the outsiders. They’re not a signatory to the Trans-Pacific Partnership. MS. IFILL: Right, by Rand Paul. MR. SANGER: By Rand Paul. And this actually seemed to flummox him for a moment. MS. IFILL: Well, details generally do. MS. IFILL: I have one final question. We don’t have a lot of time. Polls: right now it looks like the Republicans are frozen in place and that – but, however, the gap is widening between the two leading Democrats. MR. WILSON: I think we see some clear movement on the Republican side. There is a separation between the first tier and the second tier. The first tier you have to talk about Donald Trump, Ben Carson, Ted Cruz, Marco Rubio and Jeb Bush. Pretty much everybody else has fallen below about 5 percent of the poll, both in Morning Consult surveys and in the rest of the country – the rest of the sort of polling universe. On the Democratic side, we’ve seen Hillary Clinton north of 50 percent, below about 60; Bernie Sanders somewhere trading in the mid-20s to low 30s range. That’s been pretty stagnant for the last month and a half. MS. IFILL: And there doesn’t seem to be anything that’s on – whether it’s the debate or anything else coming up that could change that a lot before the holidays. We’ll see. Thank you, everybody. We’ve got to go, but as always the conversation will continue online, where among other things we will update the fallout from those Paris attacks. You could catch that and more on the Washington Week Webcast Extra later tonight and all week long at PBS.org/WashingtonWeek. But before we go, we also have a little more to share. A lot here happens behind the scenes, and one member of our family was Jamie Kendall, who we lost suddenly yesterday. Jamie was married to our great production manager, Tim Dombro, and devoted much of her life to promoting employment opportunities for people with disabilities. We send Washington Week condolences to Tim and to his family. Great guy, great woman. Keep up with daily developments with me and Judy Woodruff at the PBS NewsHour, and we’ll see you here next week on Washington Week. Good night. Investigators work to determine the planners of the Paris attack, Democratic donors have yet to give money, and Ted Cruz's debate truth. 16 min 57 sec ago. 38 min 48 sec ago. 41 min 43 sec ago.